News presenter Bae Sung-jae is being compared to a desert fox during his radio show "Bae Sung-jae's Ten." The producers of "Visual Radio" edit a program in a humorous way and upload the edited version on social media as a means to attract people. Capture from SBS radio "Bae Sung-jae's Ten." Radio is trying to make a comeback through competitive new media. Its success depends on how to draw young listeners in their teens and 20s. Nam Joong-kwon, a radio producer at major broadcaster SBS, told The Korea Times that one way was to, resort to "visible radio" and SNS, among other things. "Hardly anyone owns a radio at home nowadays ― we radio people belatedly discovered more accessible substitutes like mobile application and social media," Nam says. 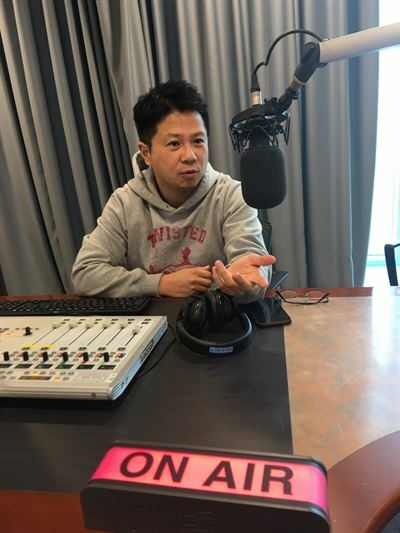 "Visual radio" is visually streaming a radio program in a studio or an open concert, or sometime making it into small, shorter clips for social media sharing among young audiences, according to the SBS producer. "Our ultimate goal is to have radio everywhere so people can listen and watch it anytime and anywhere," he says. Internet of things (IOT) already reaches into refrigerators or other white goods for radio applications and smart speakers, enabling people to turn on the radio if they say so, regardless of location and time. However, Nam says people want, more or less, of the same content. Nam cites SBS's "Kim Young-chul's Power FM" as an example. The program hosted by comedian Kim Young-chul, has a section for English learning. American TV personality Tyler Josef Rasch teaches English expressions for only about seven minutes. Mixing the program with educational content is nothing new but it has proven a rare success after being published as a book. The Podcast version was also a megahit, according to Nam. "This case verifies that radio can still adhere to its original content," he says. "I think the listeners are not looking for something amazing and novel, but instead prioritize the quality of the content." Nam also believes radio will survive and attract listeners of all ages. "Radio is not likely to fade into history," he says. "People tend to trust audio content more than television or online materials because relatively less editing is done for audio programs." Nam says the level of advertising avoidance is low for radio, which means radio can offer more impact from advertising. The advertisement market for podcasts has been growing rapidly in the U.S. ― and he thinks this can be repeated in Korea. "Numerous people find radio intimate and interactive since they can directly communicate with DJs and build rapport," Nam says. "The audio materials are less 'stressful' than video as well, as people do not have to pay full attention when listening, but instead can multi-task." Commuters are another group of devoted listeners, who usually turn the radio on when heading for work. Most listen to educational programs for self-improvement. "We found the number of listeners rises during the morning rush hours," he says.